Want to do something creative with Brussels sprouts this holiday season? Try this show-stopping soup starter! I can’t remember the first time I had a Brussels sprout, I just know that I was a sprout lover when sprout-loving wasn’t cool. It seems they were ignored for most of my lifetime. However, Brussels sprouts have now become an “it” vegetable. I think the worldwide love affair began when a food genius somewhere decided to roast them. Kudos to you, Food Genius! There’s cream-of-everything-else soup, so why not cream of Brussels sprout soup? “Cream of” soups are easy and elegant and once you make them yourself, you’ll never buy canned cream soup again. The basic technique I follow for most cream soups is to cook onion in butter and oil (oil is needed so the butter doesn’t burn), then add garlic, vegetable or chicken broth followed by the green veggie I’m using. I bring to a boil, reduce the heat and simmer uncovered until the veggies are tender–about 20 minutes. (I like to simmer uncovered so the flavors concentrate.) Typically cream, half-and-half or milk is then added. For a light cheesy touch, I will often use ricotta cheese instead. Puree until smooth in a food processor, blender or in the pot with an immersion blender (An immersion blender is highly recommended so you’re not transferring hot liquids!). Season to taste with salt and black pepper and voila! Depending upon the cream soup you’re making, alcohol such as wine or sherry or acid such as lemon juice is a nice touch. For example, sherry is amazing with mushrooms. However, when you’re working with green vegetables, alcohol and acids can turn the color of your soup a not-very-attractive drab green so it’s best to avoid them. Just sayin’! I top this creamy masterpiece with thinly sliced Brussels sprouts sauteed in a little bit of butter then seasoned with salt and pepper and…..these Butter and Turbinado Toasted Almonds! These almonds are my new favorite thing! They’re super easy, not overly sweet and also make a great salad topper. They’re kinda candied….but not. When they cool, they’re kinda like brittle….but not. No matter what, you’re going to love them! Heat 2 tablespoons butter and oil over medium-high heat in a large saucepan. Add the onion, reduce heat to medium and cook 6 to 8 minutes or until onion is softened, being careful not to brown it. Add the garlic and all but 4 of the Brussels sprouts. Stir to coat with the fat. Add the broth, bring to a boil, reduce heat to low and simmer 20 to 25 minutes or until Brussels sprouts are very tender. Add the ricotta cheese and puree until smooth. Season to taste with salt and black pepper. Keep warm. Thinly slice the remaining Brussels sprouts. In a small skillet, heat the remaining 1 tablespoon butter. Add the sliced Brussels sprouts and cook 2 to 3 minutes or until tender, being careful not to brown them. Season with salt and black pepper. Transfer to a paper-towel lined plate, spread out slightly (it's okay if they're touching) and let cool. 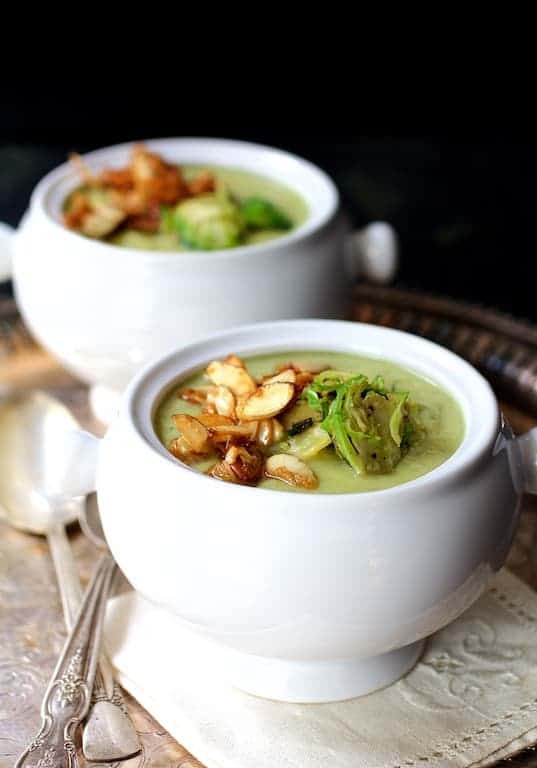 Serve soup topped with some of the cooked sliced Brussels sprouts and some of the almonds. 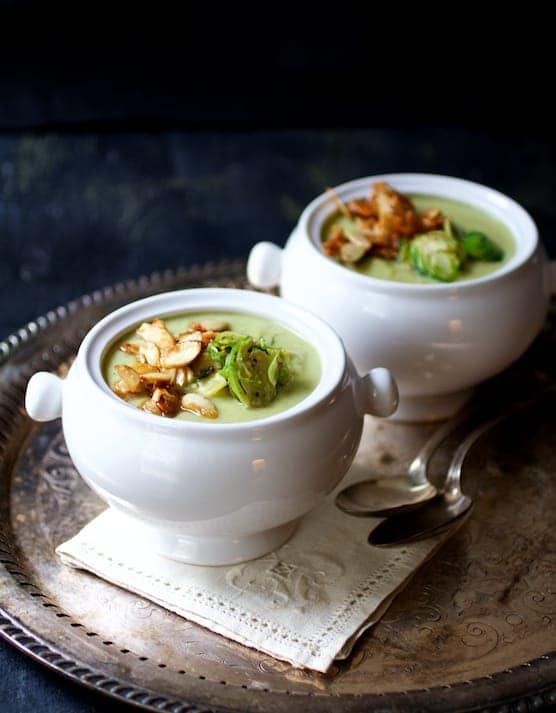 I’ve never thought to make brussels sprout soup, but this looks FANTASTIC! On the must-make list. This soup looks delicious! I love the crunch of the almonds on top too! Holy moly. This is just too beautiful. I love the idea of brussels sprout soup and those crunch almonds on top must just make it over the top awesome. Love love love. Saved and pinned! This looks wonderful! What a great way to use up those Brussels! Mmmm…those Butter and Turbinado Toasted Almonds are downright marketable and would make great nibbles on holiday tables too! I’m actually playing with a recipe I found weeks ago that uses brussels sprouts, both in the soup and as garnish. Love your cream soup, looks so elegantly presented with tasty ingredients (like the ricotta in it!). I LOVE brussel sprouts, but would never have thought to make a soup with them, but why not? Will so being trying this! Great idea! This looks amazingly delicious! I love trying new ways to cook Brussels Sprouts and I love cream soups! So it’s a win all around! 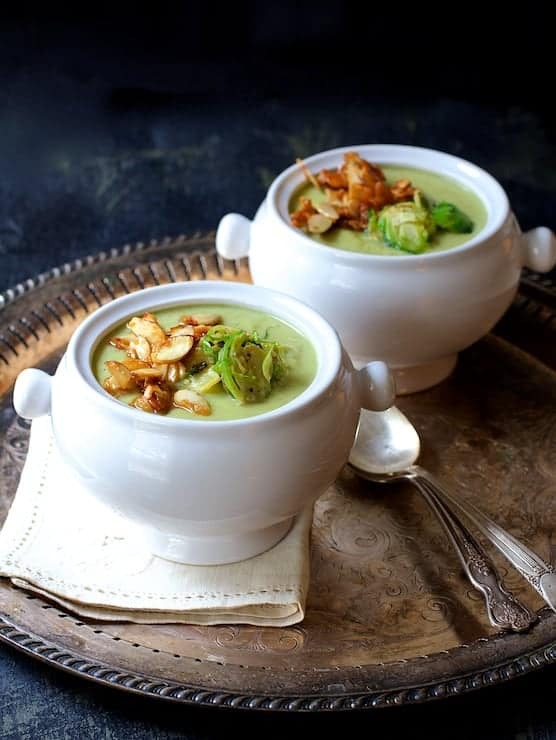 Carol, I love how creative you were with brussel sprouts in this soup–It looks perfect! !